Taylor registered her Twitter account this month. She’s brand new. She’s posted this one tweet alone. In this tweet, she’s basically tapping the Math Teacher Twitter microphone asking, “Is this thing on?” and so far the answer is “Nope.” She’s lonely. That’s bad for her and bad for us. It’s bad for her because we could be great for her. For the right teacher, Twitter is the best ambient, low-intensity professional development and community you’ll find. Maybe Twitter isn’t as good for development or community as a high-intensity, three-year program located at your school site. But if you want to get your brain spinning on an interesting problem of practice in the amount of time it takes you to tap an app, Twitter is the only game in town. And Taylor is missing out on it. It’s bad for us because she could be great for us. Our online communities on Twitter are as susceptible to groupthink as any other. No one knows how many interesting ways Taylor could challenge and provoke us, how many interesting ideas she has for teaching place value. We would have lost some of your favorite math teachers on Twitter if they hadn’t pushed through lengthy stretches of loneliness. Presumably, others didn’t persevere. Interesting looking at my early #MTBoS tweets. Most of the time I got no response at all. I wonder why I kept at it. So we’d love to see fewer lonely math teachers on Twitter, for our sake and for theirs. Last year, Matt Stoodle Baker invited people to volunteer every day of the month to check the #mtbos hashtag (one route into this community) and make sure people weren’t lonely there. Great idea. I’m signed up for the 13th day of every month, but ideally, we could distribute the work across more people and across time. Ideally, we could easily distinguish the lonely math teachers from the ones who already experience community and development on Twitter, and welcome them. I’m not the first person to want this. wondering: is it possible to make a bot that auto RTs any #MTBoS tweet that's gotten no response in x hours, so ppl are more likely to see? So here is a website I spent a little time designing that can help you identify and welcome lonely math teachers on Twitter: lonelymathteachers.com. It searches several math teaching hashtags for tweets that a) haven’t yet received any replies, b) aren’t replies themselves, and c) aren’t retweets. Those people are lonely! Reply to them! It puts an icon next to teachers who have fewer than 100 tweets or who registered their account in the last month. These people are especially lonely. It creates a weekly tally of the five “best” welcomers on Math Teacher Twitter, where “best” is defined kind of murkily. That’s it! As with everything else I’m up to in my life, I have no idea if this idea will work. But I love this place and the idea was actually going to bore a hole right out of my dang head if I didn’t do something with it. BTW. Thanks to Sam Shah, Grace Chen, Matt Stoodle, and Jackie Stone for test driving the page and offering their feedback. Thanks to Denis Lantsman for help with the code. Thanks for this Dan. I think that this is a great idea as I have come to believe that although joining these communities is relatively easy, it can be daunting and it is the initiation which is tough. As someone who has watched the #mtbos tag for a number of years before only been posting to it since late may 2017. I know that in theory it is easy to join, but it took me a long time to put that hastag on a tweet. I spent a lot of time thinking that what I was posting on my blog wasn’t worthy of the tag, you read so much amazing stuff and build a huge respect for the people there that you can’t help but compare it to your own. So when you make the plunge and put that hashtag on a tweet and it seems to go unnoticed, it is a big thing because you have put something out there that you think is worthy of the community. I think in many cases it would be much easier to not include the hashtag and just continue to read what is there to build your own practice, rather than to put yourself out there as an active participant. The twitter communities are large and it is easy to get lost in them. I have made a commitment to myself this year to find those tweets that have asked a question but not received an answer and to try to reply to those. I think when people turn to these communities for help it is because they may not have that support in there own physical network, so twitter becomes one of the few remaining ways that can get an answer to their question from a group they respect. Living in Australia I have found it hard to respond to some questions as I am not familiar with specific courses (e.g. pre-calc), but I have been slowly trying to get my head around the US system. This website should make that process of finding those unanswered questions easier for me. I featured a section of your comment, Shane. I think it’s a sentiment shared by a lot of people and I’m curious how we can make sure everyone knows they’re invited to participate. I’m a lonely math teacher who gave up trying to figure out the appeal of Twitter. I have a blog that I don’t post to much anymore because it feels like shouting into the void. And though I’m active on FB, I have yet to find a vibrant math teacher community there (only a quiet closed group I won’t disclose). The majority of the group teaches in K-12, and I teach at a community college – however, I find amazing discussions happening each day! Come join us! I agree with Rita. The Youcubed Facebook page is an awesome place! As are several others including Math Teachers Professional Learning Network. I don’t know why I didn’t think to look for YouCubed on FB. Thanks! I also signed up for MTPLN. Thanks, Linda! Hey Paul, I don’t twitter much either. I just want to say that I started blogging not to share anything with anyone except myself. I have found that it’s a pretty incredible method of reflecting. And then you put it out there and sometimes you get responses and sometimes you don’t. But, you have a record of something that you did, or you surprised yourself by doing, or even better, your students surprised you with. So, don’t give up on the blog – if it’s useful to you, then it’s worth doing. Cool idea, and it’s always awesome to see a real sustained effort at doing good. The question I found myself asking was, “What would success look like?” Is there a way to operationalize and keep track of the answers to your questions? Can we look at user growth in math teacher twitter? What groupthinks are we susceptible to, and how would we notice change? Is there a way to see if more people are helped through this site? I know that we’re just trying to find a fun way to do some good (or trying to make something good fun) but these questions sound like a lot of fun to me. Any thoughts on how to tell if lonelymathteachers dot com ends up working? I’d like to see participation increase, and I’ve been using a utility to capture usage these mathy hashtags. I’m sure I haven’t been capturing long enough to be able to separate the gradual improvement from some (hypothetical) inflection point in participation. Anecdotally, the top five “welcomers” on LMT have been way more active this week than last. Like, a 10x increase in participation. Not sure if that’s noise, some kind of change to my metrics I don’t know about, something else entirely, or if it relates to the site itself. Dan, I teach a 3-4 combo and this is my last year of teaching, unlike young Taylor who is just starting out. I love reading your blog and have used many of your ideas and activities with my students. That’s what your blog does for me and I will miss that when I retire. Thank you and the other generous mathematicians who share out their ideas for making math fun and challenging, for giving us the art of mathematics instead of just the drudgery. What a wonderful comment, Nadine, and testimony from your student. Congratulations on wrapping up this phase of your career. I hope you find ways to stay connected to the project to which you dedicated much of your professional life. Thanks, Dan for this post! Taylor is my student in her first mathematics teaching methods class at the University of Nebraska-Lincoln. 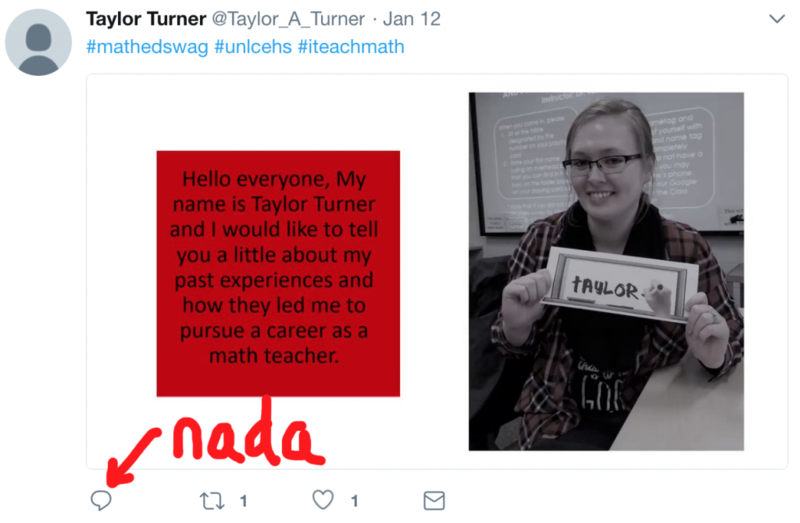 This is the third year I’ve tried to encourage my students to learn how they can learn and value the learning from networking with other math teachers on Twitter. The first plunge was tweeting a video like Taylor’s. I’m still re-tweeting them, but they can be found by searching for #mathedswag and #iteachmath. I’d love for them to get followed and welcomed! Seems like it’s working, Dan! Tried to screenshot the “”No one has replied to these 0 lonely math teacher yet”, but wasn’t able. That was a cool thing to see! So glad you found this post and shared it. I’m today’s #MTBoS ambassador – and shared and commented. I agree Twitter is the best low intensity PD out there on a daily basis. When I’m losing my momentum, the twitter/blog community really helps me re-energize. Thanks for being such a great part of it. Sharing is caring!! Ingenious outreach! By the time I read this, the list was already down to zero. Like Paul H, I “gave up trying to figure out the appeal of Twitter”. I DO get blogging, yet feel alone there as well and it eventually starts to feel pointless. What do I need to do to get myself on the LMT list?! Hey Pat, the LMT list is populated by tweets that haven’t received any replies. If you have fewer than 100 tweets or you registered your account in the last month, your tweet will pop to the top of the list. Hope to see you around! You said that you don’t include tweets that are themselves replies, which makes sense. But I saw one on there that was a quote tweet reply – which is still essentially a reply, but doesn’t work the same way. I dunno if you want to include those or not, but I figured you should know and decide yourself. Yeah, that’s interesting. Def worth thinking about for round two. Hi, Dan. I’d be willing to host the ENG teacher version of this page if you’d be willing to help me set it up. Hey Zac, thanks for volunteering. I’m not sure what it’ll take to make this rat’s nest of code and dependencies open sourced but I’ll get back to you if / when that happens. Desmos + Two Truths and a Lie	The Teaching Muscle I Want to Strengthen in 2018.